"First part of the 3 post of my Kilat-Amontoc route. Along the way at sitio Kilat area is a waterfall. 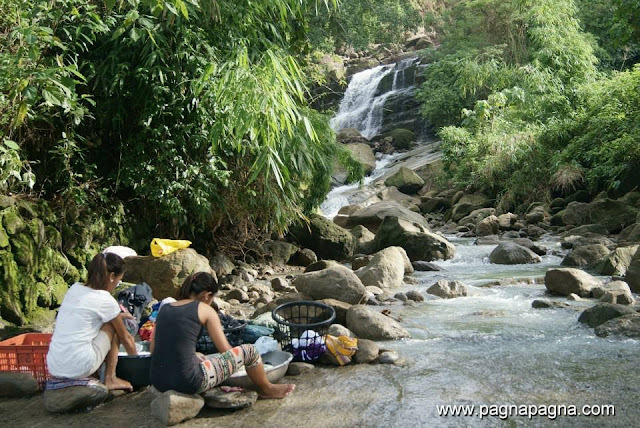 This is one of the waterfalls that is much appreciated during the rainy season and it has upper smaller cascades"
Early morning, the time was 5:50 when the jeep i rode on departed San Fernando City, La Union. It picked up 3 more passengers from the "surfing area" at Urbiztondo, San Juan, La Union. I noticed they got a "sports-action-adventure-selfie" camera with them, they probably be going to Tangadan Falls. We arrived at San Gabriel town proper at 6:22 am, particularly near the public market area. I went up at the second floor of the market to buy cooked food as my packed lunch for my hike. From the downtown area, I started walking at the road fronting the Municipal Hall going east and arrived at the intersection at the Kilat-Bucao at 6:45 am. I turned left and kept walking. The river is just below the road at the sitio Kilat of Barangay Bumbuneg. It was 7:06 am when i arrived at sitio Kilat proper. 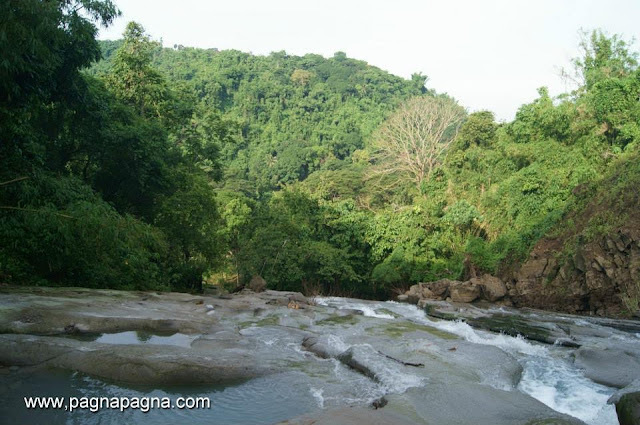 At the other side of the river was Kilat falls. I went to the other side of the river through a small dam that also serves as a bridge that continued to a road going up to the upper barangays. I greeted the women washing clothes at the mouth of the spillway of the waterfalls that merges with the river, then I went ahead to see the waterfalls. After some few minutes of taking photographs and videos of the waterfalls, I went back to the women washing clothes and asked how to get above the waterfalls. They told me where the trail going up is located and warned me to be just extra careful of the slippery surfaces of the stones. I went up above the waterfalls and saw this sloping bedrock where water had made its surface uneven and carved its way going down to the waterfalls. Going farther up were two smaller cascades or tiers that had made their own bowls or pool areas. At around 8:18 am, I left the waterfalls area and went to see "Batong Burlas" then walked my way up to barangay Amontoc and down to Tangadan Falls.